Springs have attracted humans to settle nearby where water is abundant, but careful use is necessary to balance the recharge of aquifers with the use by people. Aquifers and springs also provide aquatic habitats where unique species live on the brink of extinction. What is an aquifer? What is groundwater? How are aquifers similar? How do they differ? What is a playa lake? What role does it play in Texas? What kinds of aquatic ecosystems exist in groundwater? What adaptations enable aquatic life to exist underground? What is a spring? What are headwaters? How have springs influenced Texas’ history? How can we help conserve groundwater? How is your life connected to aquifers? Which aquifer provides groundwater where you live? How is your groundwater being used? Is it being conserved or is it being depleted? An aquifer is an underground layer of permeable rock or sand that collects, holds, and conducts water. The materials act like underground sponges allowing water to flow very slowly through it. Water in the aquifer is called groundwater. Many aquifers are like reservoirs because they store water useful to humans and aquatic ecosystems. Groundwater may naturally emerge from the aquifer as springs. When an aquifer’s water table reaches the surface, groundwater can be released as surface water into rivers and lakes. Wetlands may form where groundwater reaches ground level. If groundwater drops below the surface, these wetlands will become dry and no longer be wetlands. 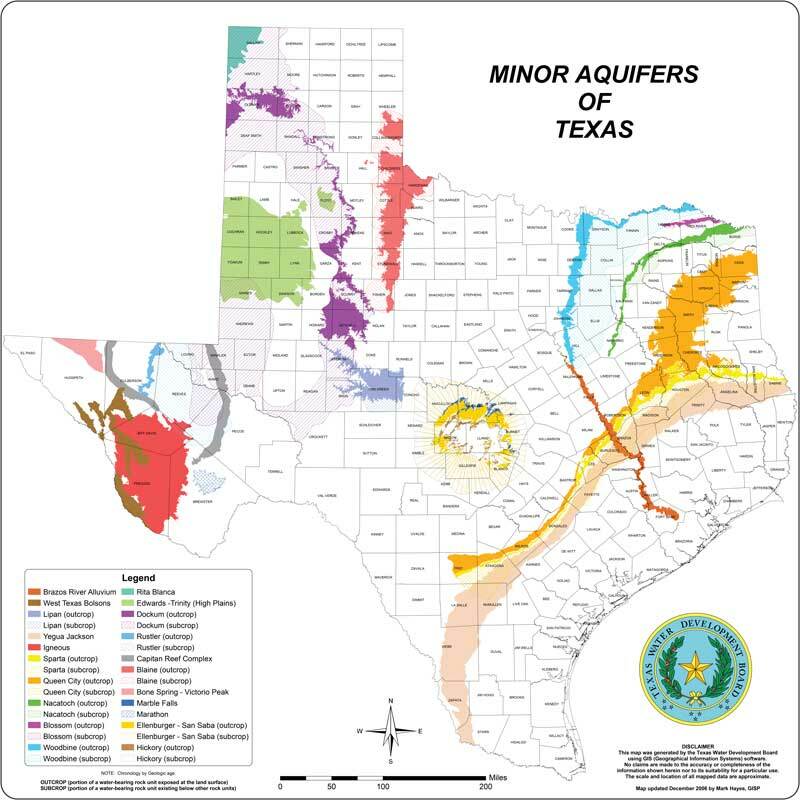 Aquifers vary in size, from narrow to wide, and may be hundreds of feet thick. They may span one to two counties, or may stretch across thousands of square miles and several states. They are recharged, or refilled, when precipitation falling on the land seeps into the ground. 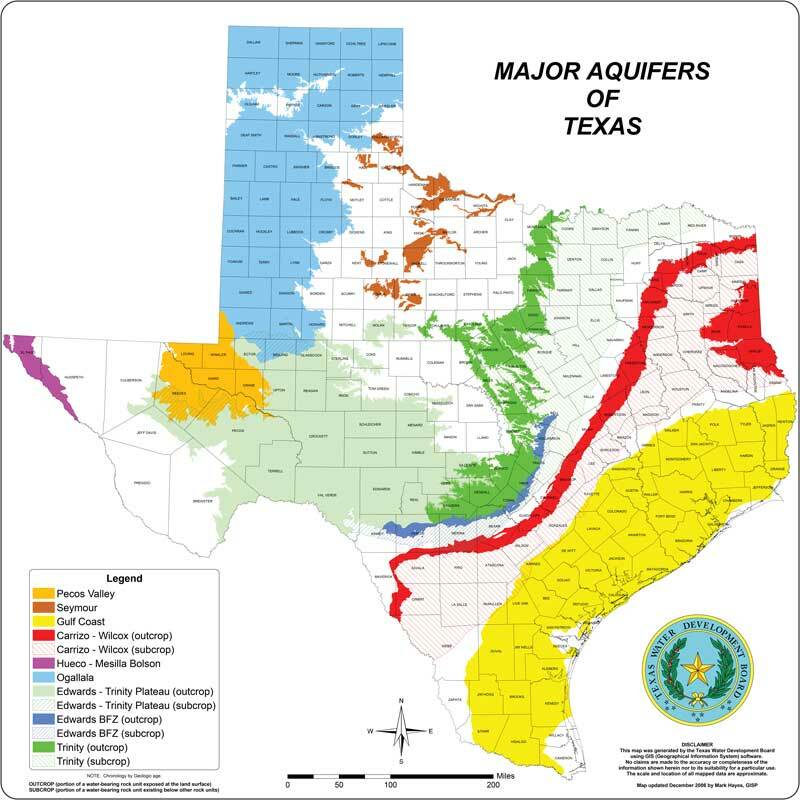 Aquifers give rise to Texas streams and rivers where springs form headwaters. People also drill wells into the aquifer to pump groundwater to the surface to use for drinking or irrigation. 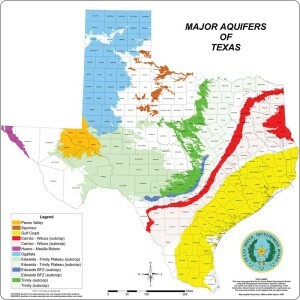 Most of Texas’ land surface lies above aquifers, some large and some small. There are nine major aquifers (Fig. 7.1) and 21 minor aquifers (Fig. 7.2) in Texas. A major aquifer contains large amounts of water spread across a large area. Minor aquifers contain smaller amounts of water spread over large areas, or larger amounts of water spread over small areas. Aquifers are an important source of water for humans, supplying about 60% of the water we use. Most of the water pumped from aquifers goes to agriculture to irrigate food crops. Over 80% of the irrigation water used in Texas comes from one aquifer, the Ogallala. The largest aquifer in the United States, the Ogallala stretches from South Dakota southward into Texas and underlies much of Texas’ High Plains region. This aquifer’s thickness averages 95 feet, although it can be over 800 feet thick in some places. The groundwater in some aquifers can be ancient. The Ogallala aquifer was formed about 2 to 6 million years ago. Groundwater can also be very new. Water that falls as rain and enters the Edwards aquifer near San Marcos can be found emerging from springs a few days or even hours later. Parts of the Edwards aquifer are like a giant underwater cave system. Groundwater can flow like a river through large openings in the underground limestone and marble rock that forms this aquifer. Unconfined aquifers are directly connected to the surface and have water levels dependent on relatively constant recharge. Groundwater flows to the surface whenever the aquifer’s upper saturated layer, called the water table, rises to the level of the land’s surface. Perhaps the best known unconfined aquifer is the Ogallala. In many places this aquifer is near the surface and recharge depends on water that collects at the surface in wetlands. As much as 95% of the recharge water in Texas comes from playa lakes. A playa lake is a naturally occurring wetland (averaging about 17 acres) formed when rain fills small depressions in the prairie. There are about 20,000 playa lakes in the High Plains of Texas. Confined aquifers are saturated layers of pervious rock bounded above and below by largely impervious rock, which water can’t pass through. This placement of the aquifer between impervious rock layers can “squeeze” the groundwater, placing it under pressure. A confined aquifer containing water under pressure is called an artesian aquifer. 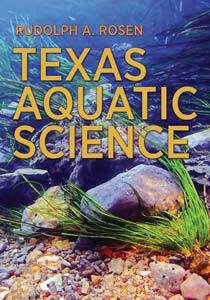 Artesian flow feeds many of Texas’ famous springs, including San Solomon Springs in West Texas. (Fig. 7.3) Artesian pressure can be so great that if a well is drilled into the aquifer, groundwater can be pushed up all the way to the surface without the need for pumps. Springs are the places aquifer water flows to the surface. A pool and often a stream are formed by springs. Texas is home to more than 3,000 springs. (Fig 7.6) Springs can be cool water or so hot the water steams and almost boils when it reaches the surface. Springs often form along faults. These are places where an earthquake has cracked and split open the earth, exposing the aquifer’s water-bearing rock. One such fault in Texas is the Balcones fault which runs from approximately the southwest part of the state near Del Rio, to the north central region near Waco along Interstate 35. For a distance of about 300 miles, this fault has exposed the Edwards aquifer creating many prominent springs (Fig. 7.4). Most aquifers do not support aquatic ecosystems as we normally think about them. There is no light underground, so no photosynthesis by plants can occur. There may be no dissolved oxygen. There are some organisms that can live in such dark, nutrient-poor anaerobic conditions. Microorganisms, primarily bacteria, protozoans, and other unicellular life, are found in aquifers. Some kinds of bacteria in groundwater are useful to humans. An example is denitrifying bacteria that remove nitrates. Excess nitrates are a water pollutant that may seep into the aquifer, particularly in agricultural regions where fertilizers or manure containing nitrates are spread on soils to enhance growth of food crops. There is one kind of aquifer that can support a more complex underground aquatic ecosystem, although the life here is very different than we see in lakes, rivers, or the ocean. The karst aquifers’ caves and underground lakes and rivers can support entire ecosystems that include invertebrates, fish, and amphibians. But these species are unlike any we are used to seeing above ground. The aquifer has no sunlight and therefore no green plants or algae with chlorophyll taking the sun’s energy and converting it to food. Without these primary producers, these aquatic systems do not have a lot of nutrients or food available. Available food is constantly recycled among the organisms, with only occasional additions from the outside. These underground ecosystems have a very low carrying capacity. They can only support a few individuals of any one species, and these individuals do not grow very large. The lack of sunlight has another consequence. The single most amazing adaptation of invertebrates, fish, and amphibians to the dark underground aquatic ecosystems is an absence of eyes. Without light there is no need for eyes. (Fig. 7.7) Predators have adapted ways to find and catch prey in the dark, and prey have adapted ways to escape. Sensory adaptations such as antennae, chemoreceptors, and touch receptors are usually highly developed in underground dwelling species. These species also often have a very low metabolism, allowing them to live on very little food. This adaptation is aided by the constant temperatures of aquifer waters, compared to surface water temperatures which can vary quickly and widely. Groundwater species live in a very stable and predictable environment. As with aquatic ecosystems above ground there can be overlaps with other ecosystems. This means species in the aquifer may not be completely isolated from life on the surface. The land surface above karst aquifers is an integral part of the habitat of animals inhabiting the underground areas. Holes in the limestone and marble of these aquifers often extend to the surface. Jacob’s Well, near Wimberley, is a good example. Here, a large opening in the stream bed of Cypress Creek is actually a water-filled cave extending deep into the aquifer. There are also caves open to the surface that lead to the aquifer. Because plants can’t grow in darkness, the cave and associated underwater ecosystem is dependent on plant and animal materials being washed into the cave from the outside. Food in a cave can also come from organisms such as bats, mice, and crickets that take shelter in caves. They can become food (prey) for cave dwellers or leave “food” behind when they leave. For example, bat and mouse feces dropped on a cave floor provides nutrients fungi need to grow. Fungi are eaten by several species of insects that may wander in and out of the cave. These insects reproduce rapidly, move about the cave, and become prey for predatory invertebrates that live their entire lives in the cave. These invertebrates fall into the water and are swept deep into the aquifer where they can be eaten by species such as the Texas blind salamander. The salamander is eaten by the toothless blindcat, a catfish that lives over 1,000 feet below the Earth’s surface. The aquifer ecosystem extends beyond the aquifer itself where groundwater emerges into the spring. Here the groundwater mixes with surface water in the spring, stream, rivers, and lakes. However it is in the springs formed by the aquifer’s emerging waters where the unique underground ecosystem truly extends to the surface. 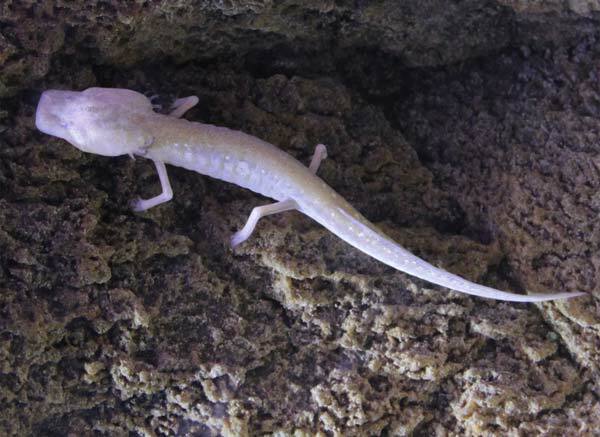 We occasionally get a rare glimpse of life in the underground ecosystem when an invertebrate, fish or, salamander from the Edwards aquifer gets swept out at a spring. You may see one of these odd creatures, or one of the predators that like to eat them, when you tour the San Marcos Springs in a glass bottom boat. 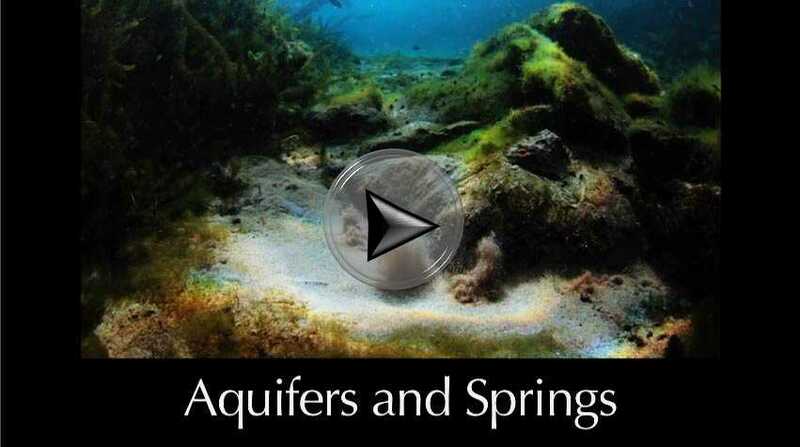 While many aquifers do not contain aquatic life, most major springs in Texas do. Some even contain species found nowhere else. The Edwards aquifer ecosystem and its springs contain over 60 species of plants and animals that live nowhere else in the world. Species of salamanders, fish, amphipods, beetles, spiders, and others have evolved in isolated habitats within the aquifer and springs. Many of these live in the dry caves above the water table and others live in the many springs fed by the aquifer. Barton Springs, located in Austin, is the only place where the Barton Springs and Austin blind salamanders live. Fountain darters live only in the San Marcos and Comal rivers headwaters. Texas Wild Rice lives only in the San Marcos Springs and river immediately downstream of the springs. Because springs are exposed to sunlight, aquatic plants and algae play a role in providing nutrients. A relatively constant temperature, at least near spring openings, allows species to adapt to a highly specialized lifestyle. These species often can’t exist very far from the spring, including in the stream and river the spring creates. Water temperatures in particular may limit a species adapted to a spring ecosystem from wandering beyond the vicinity of the spring. Cool spring waters may quickly warm when exposed to Texas’ hot weather. As a result, spring ecosystems tend to be small, allowing only relatively small populations of any one species to survive. As with species adapted for a life completely underground, species in spring ecosystems may be greatly affected by even small changes to their habitat. For species in a spring, lowered spring flow due to drought or groundwater withdrawals may reduce habitat and create significant stress. Invasive species may quickly overwhelm and outcompete native spring species. Many of Texas’ stream ecosystems have been impacted by both flow reductions and invasive species. Humans have made the most changes to springs. Many of Texas’ largest springs have even been turned into swimming pools by placing a dam across water flowing from the spring. 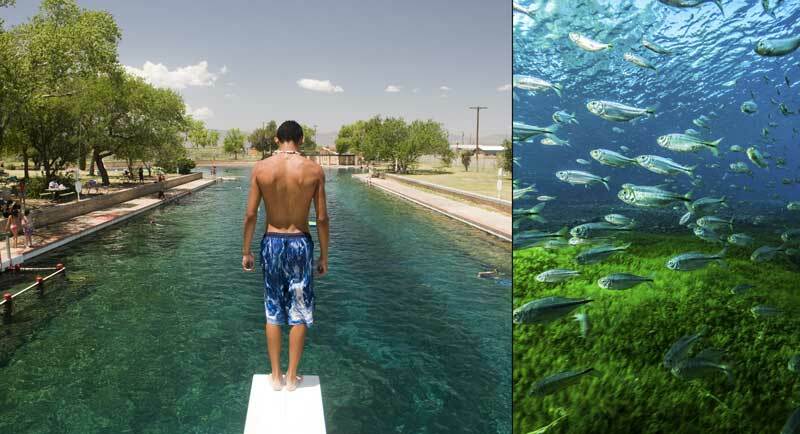 These include Barton Springs Pool in Austin and the largest spring-fed swimming pool in the world, located at Balmorhea State Park in West Texas. At such places, the native spring ecosystems no longer exist. Groundwater in an aquifer is like money in your bank. Each time you put money in your bank, the amount of money you have grows. When you withdraw money from your bank to buy something, your bank account goes down and stays down until you put more money in. Aquifers grow when nature puts water in through rainfall, snow, and other precipitation. Water leaves the aquifer naturally along streams, at springs, and through other openings. Humans greatly increase water withdrawals by drilling wells into the aquifer and pumping water out. Just as withdrawing money from your bank account depletes the money you have for future use, withdrawing groundwater without equal or greater deposits of rain depletes our groundwater. The size of the aquifer and how full it is determines how much water it is holding at any point in time. The porosity of the aquifer determines the rate at which water can move through or into the aquifer. 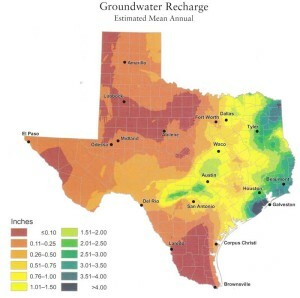 Some aquifers refill rapidly, so if there is sufficient rainfall in the aquifer area the amount of time needed to recharge the aquifer may be short. (Fig. 7.8) The Edwards aquifer can recharge quickly. In some places water in the Edwards aquifer can move as far as eight miles in a single day. Water may take hundreds or tens of thousands of years to move that far in other aquifers. The Edwards aquifer can also be emptied rapidly if the groundwater is not conserved. Other aquifers, such as the Ogallala, have an enormous capacity to store water, but can take very long to recharge. Water taken from aquifers that recharge slowly is almost like mining a nonrenewable resource such as coal or copper. Once water is taken out, recharge will take so long that for all practical purposes the aquifer is no longer of use to humans. Water from the Ogallala is now being pumped out by nearly 200,000 irrigation wells, with the highest rates of pumping generally occurring during the driest years. In southern parts of the aquifer pumping has already lowered the water table as much as 200 feet. Pollutants, such as gasoline, oil, runoff from roads, fertilizers, and chemicals can seep into the groundwater. Sources of groundwater pollution include hazardous waste sites, and landfills. Aquifers act like natural filters that trap sediment and other particles. They provide natural purification of the groundwater flowing through them, so water coming out of an aquifer is usually cleaner than when going in. However, many dissolved substances may not be filtered. Despite natural purification, groundwater can become polluted. Natural concentrations of some contaminants can be high. For example some groundwater contains high natural concentrations of iron, hydrogen sulfide, salts, manganese, uranium, or arsenic. Sometimes groundwater must be treated through special processes so humans can use the water safely. Due to the increasing loss and contamination of this special habitat, many of Texas’ unique spring and underground dwelling species have been declared by government agencies to be threatened or endangered with extinction. Fig. 7.4 — Springs have played a large role in the economic development of Texas. Many cities were built near springs that provided water for native Americans and early settlers. Salado was built around Salado Springs, the 12th largest spring in Texas. Salado Springs is located near the Stagecoach Inn, on the east side of Interstate 35. Austin, the Texas state capitol, was built where it is because of the consistent and abundant flow of water from Barton Springs, the 5th largest spring in the state. Today the springs are more commonly known as Barton Springs Pool which is located in Zilker Park and is open for swimming year-round. San Marcos was built around the San Marcos Springs, the 2nd largest in Texas. These springs were home to native Americans long before Europeans arrived and are thought to be the longest continually inhabited site in North America. For many years it was the location of Aquarena, an amusement park featuring glass-bottom boat rides so visitors could view the underwater life. Today the springs are part of the campus of Texas State University where visitors can still take glass-bottom boat rides and learn about the aquatic ecosystems in the spring. New Braunfels was built at the largest of Texas’ springs, Comal Springs. 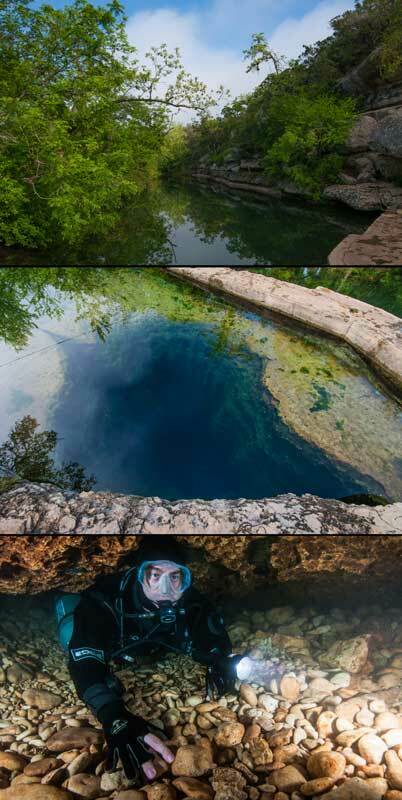 These springs are also the largest in the United States west of the Mississippi River. They are located at Landa Park and form the headwaters of the Comal River. Just downstream of the park is Schlitterbahn where hundreds of thousands of Texans enjoy the Comal River’s waters each summer. San Antonio was built around San Antonio and San Pedro Springs. San Antonio Springs flow out of the aquifer on the property of the Incarnate Word Sisters north of downtown San Antonio in a place called the Headwaters Sanctuary. The waters then flow through Brackenridge Park into downtown San Antonio. San Pedro Springs emerge in San Pedro Park, the second oldest public park in the United States. Spanish missionaries located here in the early 1700s. San Antonio is the largest city in North America wholly dependent on groundwater. As a result, the city’s future depends on maintaining the sustainability of the Edwards aquifer which feeds the springs. Uvalde was built near the Leona River, which is fed water by Leona Springs. This large group of springs now has reduced flows. Fort Clark, now called Brackettville, was built around Las Moras Springs. These springs supplied the military fort with water from 1852 until just after World War II. The springs now feed into a public swimming pool. Del Rio was built on Texas’ 4th largest springs, the San Felipe Springs. These are a group of ten or more springs that extend for over a mile along San Felipe Creek on the grounds of the San Felipe Country Club and several ranches to the north of Highway 90.